Although Scottie Upshall was released from his PTO by Edmonton on Monday as his leg injury continues to linger, his time with the organization may not be over just yet. Postmedia’s Robert Tychkowski reports that the Oilers have offered him the chance to rehab in Edmonton and an opportunity to play with their AHL affiliate in Bakersfield once he gets the green light to return to game action. Upshall has yet to decide whether or not to take them up on their offer. If he wants to return to the NHL this season though, it’s likely that he will need to spend some time at the minor league level to show he’s fully healthy. While shifting the focus to a bridge deal with winger William Nylander might help get him locked up before the season starts, Maple Leafs GM Kyle Dubas stated in an interview on Sportsnet 590 (audio link) that doing so would be a “sub-optimal” He reiterated that both sides’ preference remains to get a long-term deal done although there is still a sizable gap to be bridged. Dubas also acknowledged that they have received inquiries from other teams regarding Nylander’s availability but emphasized that they are not shopping the 22-year-old. It’s never too early to think about the next college free agent market and 11 teams have already expressed some interest in Miami (Ohio) defenseman Grant Hutton, reports Sportsnet’s Elliotte Friedman. Among those teams is Ottawa, as GM Pierre Dorion met with the 23-year-old. Hutton is entering his senior year and is coming off of a productive junior campaign with 13 goals and 14 assists in 36 games. September 13th: Sportsnet’s Mark Spector reports that Upshall failed his physical with the Oilers today. Upshall has been dealing with a knee injury and did not report to training camp at full strength. While this does not cancel out his PTO, it certainly hurts his chances of landing a contract, despite Edmonton’s need for veteran leadership and penalty killing ability. It is uncertain when Upshall will be ready to fully participate, with Spector speculating it could be “a few weeks”. In the meantime, Upshall will be unable to show that he is still in NHL shape and will likely lose his roster spot to a younger player or potentially another veteran brought in to replace him. August 19th: It’s officially PTO season. After the Florida Panthers made Mark Letestu the first notable name signed to a professional tryout agreement this off-season with an agreement last week, the Edmonton Oilers have now joined in on the action. The team announced this afternoon that they come to terms with veteran forward Scottie Upshall on a PTO. The Oilers are not overflowing with forward depth, making the Alberta native’s odds of landing a contract relatively good. This move comes as little surprise in regards to Upshall. The 34-year-old has been down this road before; he played on not one but two PTO’s last fall, first joining the Vancouver Canucks before eventually returning to the St. Louis Blues and earning a contract. He again stands a good chance of winning a spot, this time with Edmonton. Gone are the days when Upshall could produce 30+ points every year, but he still does everything else well. A smart, hard-working forward, Upshall can still give a team modest offense – he scored 19 points in 63 games last year – but it is his two-way play that keeps him valuable. Upshall was one of the Blues’ primary penalty killers last season and still plays with energy, grit, and toughness. Ironically, Upshall’s frequent running mate in St. Louis, both five-on-five and shorthanded, was Kyle Brodziak, who signed with Edmonton earlier this summer. It seems likely that the Oilers considered that when inviting Upshall to camp. St. Louis was not a league leader in killing penalties or fourth line production last season, but the chemistry between Upshall and Brodziak would nevertheless be a major boost for Edmonton. In moving on from Letestu, the Oilers lost their leading penalty killer from last season. They would also likely enjoy not having to deploy Ryan Nugent-Hopkins while man-down as frequently as they did in 2017-18. Upshall could fit in nicely alongside Brodziak both on the bottom line and the PK, so long as he looks like he can still keep up in his sixteenth year in the league. This could end up being a shrewd PTO pickup by GM Peter Chiarelli and company. The Edmonton Oilers are out ahead of the crowd when it comes to locking up tryout candidates this off-season. After adding experienced two-way forward Scottie Upshall on a PTO last week, the team has now added another veteran to the mix. The Oilers have announced a PTO agreement with former Vegas Golden Knights defenseman Jason Garrison. With more than 500 NHL games under his belt, Garrison could help to make up for the loss of blue line leader Andrej Sekera if he performs well enough in camp. Garrison is looking for any opportunity to get his career back on track. Once considered an elite defenseman, as evidenced by the six-year, $27.6MM contract that just expired, Garrison has been anything but in recent years. After his play slipped in his final years with the Tampa Bay Lightning, the team arranged for Garrison to be selected by Vegas in the 2017 NHL Expansion Draft, even giving up the rights to KHL star Nikita Gusev and a pair of high picks to do so. Garrison then skated in just eight games with the Knights last season, clearing waivers twice over the course of a campaign spent almost entirely in the AHL. At 33 years old, Garrison is hoping to show that he can still make a difference in the NHL. It is no surprise that the free agent market was quiet for the struggling defender, but he may have found a great option in a PTO with the Oilers. Since Sekera went down, there has been almost unanimous agreement among hockey pundits that Edmonton needed to make an addition. While the team has since added Jakub Jerabek, it would not be a shock to see the older, more experienced Garrison win a roster spot on a blue line that features an average NHL games played of 260 among the currently-slated starters. Garrison could not only make the team, but be a locker room leader for a squad that fell well short of expectations last year and could use some guidance in their effort to return to the postseason. There will be no suspension for Brad Marchand in his latest on-ice incident, instead receiving a $5,000 fine from the Department of Player Safety. Marchand appeared to cross-check a prone Andrew MacDonald in the face during the Boston-Bruins-Philadelphia Flyers game this weekend, but he will escape without missing any time. This is the third time this season that Marchand has been given some form of supplementary discipline, after receiving a five-game suspension for elbowing Marcus Johansson and a $2,000 fine for a pair of diving/embellishment instances. This is the fourth such season with multiple incidents for Marchand, who despite being one of the best offensive weapons in the league has built quite a reputation for himself as a over-the-line player. Scottie Upshall will not return for the St. Louis Blues this season, after suffering a lacerated kidney against the Arizona Coyotes. The injury occurred on a relatively innocuous-looking hit from Luke Schenn, but could mean some missed playoff time for the energy forward. Officially listed as out indefinitely, Upshall won’t be able to help the Blues attempt to catch Colorado or Los Angeles for one of the last few playoff spots. Alex Formenton has been assigned to the Belleville Senators, now that his London Knights have been eliminated from the OHL playoffs. The 18-year old Formenton played one game for the Ottawa Senators at the beginning of the year, but was sent back to junior where he could suit up for Team Canada and register 48 points in 49 games for the Knights. He’ll get a chance to show what he can do at the AHL level before battling for a spot with Ottawa in the fall. If he doesn’t make the NHL team, another trip back to junior is a possibility. If the St. Louis Blues are going to make a late push for the playoffs, they’ll have to do it without their most experienced defenseman. The team announced today that Jay Bouwmeester will be out for the remainder of the season dealing with his hip injury, and faces a four to six month recovery timeline. Scottie Upshall is also in danger of losing the rest of the year, and will be re-evaluated in four weeks after suffering an MCL sprain. Bouwmeester had been dealing with an injury to his hip for some time, but ended up leaving Saturday’s game against the Dallas Stars after playing just 9:46. The 15-year NHL veteran will have a long rehab in front of him, but hopefully will be ready for the beginning of the 2018-19 season. He’ll be 35 when the Blues start their year in October, and on the final season of his current contract that carries a $5.4MM cap hit. Upshall, 34, turned a professional tryout with Vancouver into another contract with the St. Louis Blues this year after injury struck their team in training camp. Despite being expected to be an extra forward, he’s played in 61 games and actually has contributed 18 points. The physical, energy-filled forward has been an effective checking line player for his entire career, playing in 757 NHL games. He’ll have to fight to get another one-way contract next season, but has never been one to underestimate. The context behind the St. Louis Blues’ call-up of Ivan Barbashev is now clear. The Blues have announced that Jaden Schwartz suffered a right ankle injury in yesterday’s game against the Detroit Red Wings. He will be re-evaluated in six weeks, during which time the team will have to lean on Barbashev or another AHL forward as his replacement. This is a devastating blow for the red-hot Blues. Schwartz has struggled with injuries in the past but has always produced at a high level when healthy. Schwartz has 35 points in 30 games and an incredible +23 rating. Schwartz is currently second on the team in points, goals, and plus/minus behind only linemate Brayden Schenn and tied with Schenn for assists. His impact on special teams can also not be understated. Schwartz’s absence will be quite the test for St. Louis. While they were fortunate to get Patrik Berglund back from injury before Schwartz went down and have also seen surprising production from the likes of Vladimir Sobotka, Scottie Upshall, and Dmitrij Jaskin, it will still be very difficult to make up for the loss of Schwartz for the next month and a half. Barbashev, the presumptive replacement for Schwartz as a top nine forward, had been held scoreless so far in the NHL this season and Wade Megan and Tage Thompson had the same luck in their short stints. One of those three young forwards needs to step up or else the Blues could see their lead in the Central slip away in no time, with the Nashville Predators and Winnipeg Jets right on their tail. The St. Louis Blues have officially brought back a familiar face while they deal with several injuries, signing Scottie Upshall to a one-year, $800K contract, according to Fox Sports Andy Strickland. Upshall had been in Vancouver Canucks’ camp on a professional tryout, but will return to the Blues to help give them some forward depth. The team is dealing with injuries to Robby Fabbri, Patrik Berglund, Alex Steen and Zach Sanford up front. Upshall never did quite live up to his sixth-overall draft position, but has nevertheless put together an excellent career. With 696 games under his belt, Upshall has been one of the more consistent bottom-six wingers around the league, providing some physicality and secondary scoring touch. A career-high of 37 points makes his addition far from enough to replace the lost offense from Fabbri, but his experience might be able to help what is suddenly looking like a very young roster. Upshall has always been lauded for his leadership qualities and work ethic. The Blues will be relying on players like Ivan Barbashev and even perhaps Klim Kostin, but will at least have some more NHL experience on the roster with Upshall. He’ll likely serve as a sort of 13th forward, moving in and out of the lineup whenever needed. Still, he did register 10 goals last year and was one of their key penalty killers. For less than $1MM, it poses almost no risk. The Vancouver Canucks have decided to bring in another veteran forward on a professional tryout, signing Scottie Upshall to a PTO according to Sportsnet’s Dan Murphy. He’ll join Ryan White in Canucks camp trying to force themselves onto an NHL roster. For a team looking to rebuild, either one could provide another deadline asset. Upshall is one of the most interesting draft stories of the last few decades. Selected sixth-overall by the Nashville Predators, Upshall was a do-it-all player for the Kamploops Blazers who mixed goal scoring with physicality and defense. His WHL team had winning records in all three seasons, and he was one of the stars for Team Canada in both World Junior Championships—one in which he served as captain. He was expected to become a premiere two-way forward in the league, capable of contributing 20-25 goals while handing out punishing checks. Comparisons to Michael Peca were made. Upshall never did grow into his offensive potential, capping out at 18 goals and 37 points during his career so far. But, instead of fading into the distance like other draft “busts” he has remained in the league as an important player for several franchises. Suiting up in 696 games so far, Upshall was a welcome addition to the St. Louis Blues most recently, scoring 10 goals and being a grade-A pest every night. It’s surprising that he has only earned a PTO, as even at 33 there is definitely enough left to help a team’s fourth line. We’ll have to wait and see if he gets an NHL deal or has to settle for an AHL pact. The latter would allow him to play in the Olympics for Team Canada if they’re so inclined. St. Louis Blues beat writer Norm Sanders analyzed the situation the Blues find themselves in as the draft and free agency approaches. After signing both Scottie Upshall and Dmitrij Jaskin, the Blues still have a number of decisions facing them. Sanders writes that Jaden Schwartz will be signed first as he’s been dubbed a “priority signing” by general manager Doug Armstrong. He also names defensive Kevin Shattenkirk as a candidate to be traded since he’s approaching the final year of his contract. Sanders also makes note that his name has constantly been floated as being moved to another team. As for captain David Backes, Sanders writes that unless an agreement is had, Backes would be a much sought after free agent. Penguins goalie Marc-Andre Fleury must feel like he’s either back in high school or in a hockey soap opera. Fleury has been the subject of trade rumors ever since the emergence of Matt Murray during the 2016 Stanley Cup playoff run. Interesting then that his name only comes up as #14 on Frank Seravalli’s TSN Top Trade Bait mentions. Fleury’s name was all over the hockey world as being moved to Calgary until Pittsburgh general manager Jim Rutherford announced that he wasn’t aggresively shopping the former #1 overall pick. Seravalli put the aforementioned Shattenkirk as his #1 target to be dealt while Pavel Datsyuk’s contract sits at #2. The Edmonton Oilers stand as having the most targets likely to be moved with Taylor Hall, Ryan Nugent-Hopkins, Nail Yakupov, Jordan Eberle, and their 4th overall pick in this year’s draft being tagged. NBC Sports Pro Hockey Talk’s Ryan Dadoun scouted free agent Alexander Radulov and what it would take to land him. Dadoun writes that Radulov is purportedly looking for a 2-year/$15MM deal but that might not happen for a player who left the NHL for the KHL and was reported to be a locker room liability. Most teams are comfortable with a 1-year deal to see if Radulov’s KHL successes transfer across the ocean. PHR ranked Radulov as the 11th best free agent on the market and predicted that he would land with Capitals for just over $5MM. 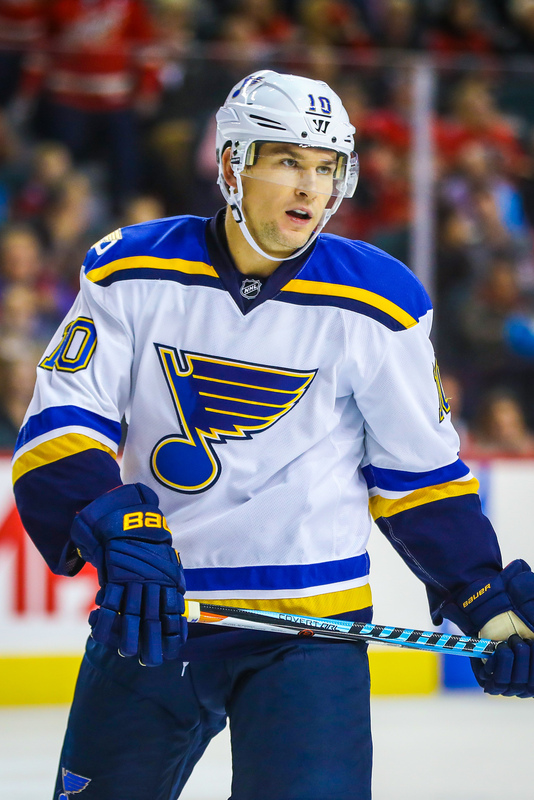 Per a team release, the St. Louis Blues announced that forward Scottie Upshall was re-signed to a one-year deal. Frank Seravalli reports that the deal is for $900,000. Upshall was a training camp invitee for the Blues last season and made the most of that invite. After an injury plagued campaign with the Florida Panthers, Upshall rebounded in St. Louis, posting 14 points (6-8), and adding a wrinkle to a stingy Blues penalty kill. For $900,000, Upshall is a bargain signing for a team that has a number of names still looking to be signed. Those names include Steve Ott, captain David Backes, Troy Brouwer and Kyle Brodziak.